Syracuse University has been named a recipient of a 2010 Campus Technology Innovators Award for Ensemble Video and its automated media workflow systems. In the sixth annual competition, 11 winners were selected in six categories from 484 nominations by higher education institutions around the globe. The winning projects will be described in detail in the August issue of Campus Technology magazine. The winners will also be spotlighted at the Campus Technology 2010 conference, to be held July 19-22 at the Seaport World Trade Center in Boston. Ensemble Video is an innovative enterprise video content management platform developed at Syracuse University and currently in use at nearly two dozen organizations, including the University of Illinois, Clemson University, Colgate University, Temple University and Singapore Management University. Ensemble Video is also available pre-installed on a proprietary appliance from Advanced Media Design Inc., an original equipment manufacturer; customers include the University of Kentucky, Pepperdine University, Northeastern University and the University of California at Santa Barbara. 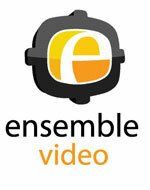 Ensemble Video is the flagship product of Symphony Video Inc., a provider of Internet video software and services. The founder and CEO of Symphony Video is Andy Covell, a graduate of SU’s School of Computer and Information Science and a University staff member for more than 25 years, principally in SU’s Martin J. Whitman School of Management as manager of faculty computing services and later as director and then executive director of information technology. It was during his time at the Whitman School that Covell envisioned Ensemble Video. The simplification and flexibility provided by Ensemble Video has significantly increased the usage and consumption of online video at SU, Nadzan says. In less than two years, SU’s online video content has jumped from a few hundred videos offered by a handful of departments to about 4,500 videos produced by several dozen departments. For more on Ensemble Video, visit http://www.ensemblevideo.com or contact Bill Bullen, vice president of sales and marketing for Symphony Video Inc., at (315) 378-0234 or bbullen@ensemblevideo.com. To view the Syracuse University Video Showcase, SU’s repository of online video, powered by Ensemble Video, visit http://video.syr.edu/.